I’ve been attempting to bake delicious and chewy chocolate chip cookies over the past few months but have been struggling big time! On my first attempt, I tried a recipe that claims to be Mrs. Fields-like, but it ended up tasting more like shortbread. It was edible, but not what I was looking for. On my second attempt, the chocolate chip cookies were hard like a rock. I tried to cut the recipe in half and miscalculated the measurements. Bad mistake. However, I didn’t let that discourage me. I told myself I was going to keep trying until it turned out the way I want. Finally, on my third attempt, I used the Big and Chewy Chocolate Chip Cookies recipe from the America’s Test Kitchen Family Cookbook and did not try to get creative and alter the recipe in any way. I just focused on making it turn out the way I keep envisioning it in my mind. After I took the cookies out the oven and waited for it to finish cooking and cool down, I was happy with the way it looked. It wasn’t deformed and funny looking like the cookies from the first few times I baked it. Yes! Then, it was taste time. I was quite nervous. I closed my eyes and took a big bite. After the first bite, I grinned and had one of those MMmmMm… facial expressions like the food celebrities on TV when they taste the food they cook. 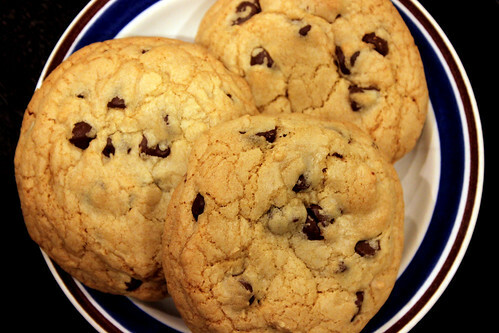 The chocolate chip cookies were crispy on the outside, soft and chewy on the inside and bursting with chocolate in every bite. I am very happy with the way it turned out and will continue using this recipe in the future. Melt unsalted butter in a saucepan and set aside to cool. Preheat the oven on bake to 325 degrees. Whisk all-purpose flour, baking soda, and salt together in a mixing bowl and set aside. When the butter is cooled, in a large bowl, beat the butter and sugars using an electric mixer on medium speed for about 1-2 minutes or until combined. Add eggs, egg yolks, and vanilla extract to the sugar/butter and beat for another 30 seconds. Reduce mixer speed to low and slowly add flour until combined. 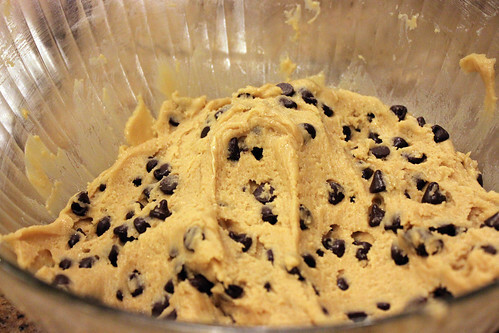 Mix in chocolate chips into dough until fully incorporated. Make 1/4 cup balls, place on baking sheet, and separate about 2 1/2 inches apart. Bake about 18-19 minutes and rotate baking sheet halfway through baking. 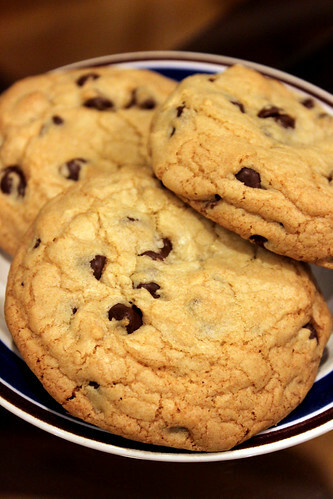 Allow cookies to cool for about 10 minutes before serving or transferring to wire rack for cooling.